Line forms hours before store opens. Nordstrom Rack opened in Farmington on Thursday at 9 a.m. and close to 1,000 people were there for the grand opening. Part of opening day was the chance to win a $2,000 "Race Through the Rack" shopping spree and Sean Keating, of West Hartford, was the lucky winner. "I never win stuff like this," he said. He had 90 seconds to race through the store and select up to $2,000 in merchandise. 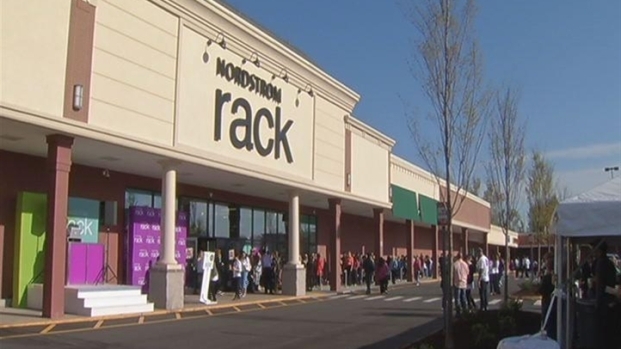 Nearly 1,000 people waited in line for deals and a chance to win a $2,000 shopping spree at the grand opening of Nordstrom Rack in Farmington. Sean Keating of West Hartford was the lucky shopping spree winner. Other shoppers took advantage of huge discounts and secret gold hangers that could be redeemed for a $100 gift card. "I need a suit. That's the first think I thought about. I grabbed like 10 of them," Keating said. The store opened with 25,000 pairs of shoes, more than 1,000 handbags, 2,000 men's ties and more. If you could not make it for the grand opening, you're not out of luck. The store will have "genius deals" in the afternoon and evening too, according to a response they gave one fan on Facebook. If you’re not familiar with Nordstrom Rack, it's the discount division of the high-end retailer, where you can get merchandise at 50 to 60 percent off Nordstrom’s original prices. If shoes and accessories are your weakness, you’re in luck. Nordstrom Rack carries many of the brands you find in Nordstrom stores for 30 to 70 percent off. Some of the items are specially bought for Nordstrom Rack. This is the first Nordstrom Rack to open in the state. You can follow Nordstrom Rack on Facebook or on Twitter.